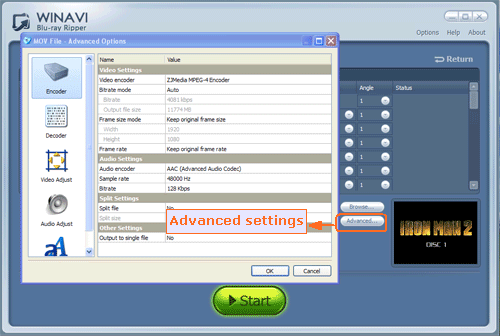 It is very easy to rip Bluray to MOV video format by using WinAVI Bluray Ripper. 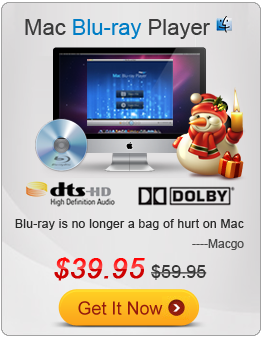 This software is easy to use and rip Bluray to mov with the copyright protections such as AASC, BD+ and region code. 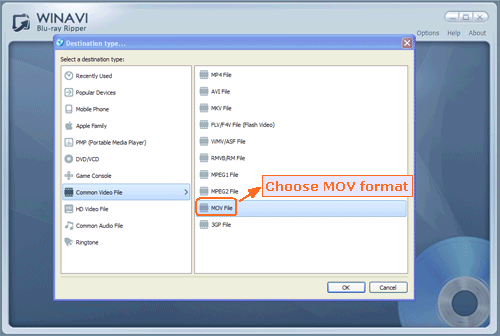 This article will guide you how to rip Bluray and convert Bluray to MOV video format step by step. Please follow us. Step 2: Load Blu-ray movie files that you would like to rip by clicking "Convert from Blu-ray Drive ", or "Convert from Blu-ray directory" or "Convert from Blu-ray Image File" button. Then choose "MOV" format on the pop up small window. Step 3: Click "Advanced " option to customize MOV video of output. Step 4: Click "Start" button and the program begin to rip Blu-ray to MOV format for you. After a while, click "Open the output directory" to check the converted MOV video format when the Bluray to MOV conversion is complete.